Fast & easy meals in a snap! 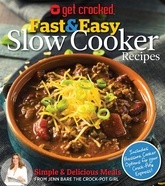 From the author of Get Crocked Soups & Stews comes a new collection of slow cooker recipes, each developed to be as easy to make as possible without sacrificing flavor. Plus, each recipe comes with instructions for a Crock-Pot Express® variation. The Crock-Pot® Girl, Jenn Bare, offers more than 175 of her easiest slow cooker recipes for everything from hearty breakfasts and satisfying soups to scrumptious mains and sides…desserts, too! Asian, Mexican, and classic American flavors abound, made with whole, fresh ingredients—with a little help from our friends canned broth, spice blends, and refrigerated dough. Even if the day’s been super-busy, your night doesn’t have to be.